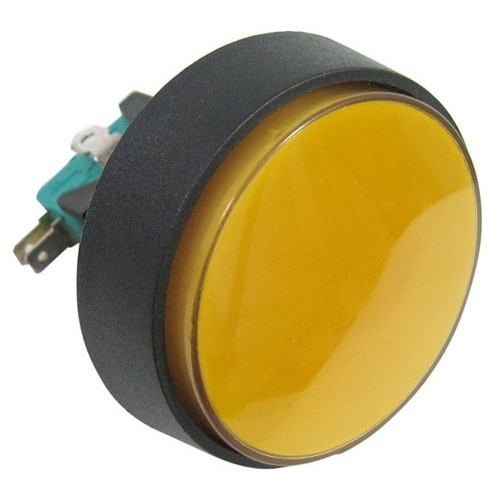 These large momentary SPDT push-button switches are rated 10A at 125/250VAC and are mounted to a 2-7/16"dia lens plate with a 1-1/8" long x 15/16 - 2 shaft that comes with a plastic washer and nut. 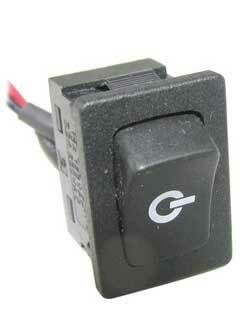 There's also an internal 12V 3W replaceable indicator bulb. Needs 3" of rear clearance. You pick a red, green or yellow lens. The correct answer is "I don't know; I've never toggled." 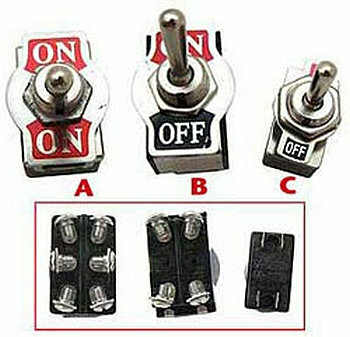 If, however, you just want to turn something on and off, here's a choice of toggles for your switching delectation. 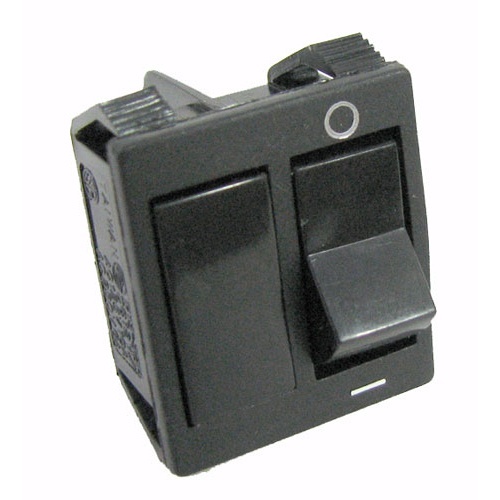 The DPDT toggle is rated for up to 20A at 125VAC and has screw terminals below. Measures 1-1/4" x 1-3/4". No center-off position. The first DPST toggle is rated for 20A at 125VAC or 15A at 250VAC. Screw terminals on the bottom. Measures 1-5/16" x 3/4". The smaller DPST toggle is rated for up to 4A at 125VAC or 2A at 250VAC. 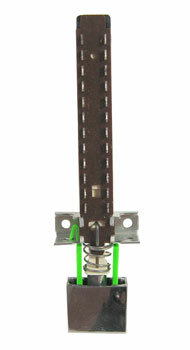 Has 3/16" spade terminals on the bottom and measures 1" X 9/16". All the toggles come with switch-plates and mounting nuts. 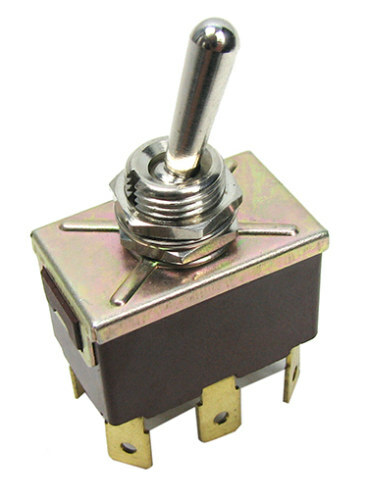 This momentary rocker switch is just 3/4" x 9/16" x 9/16" deep with 1/8" quick-disconnect terminals at the bottom. It's rated for up to 15A at 125VAC, 7.5A at 250VAC and is normally open. UL. 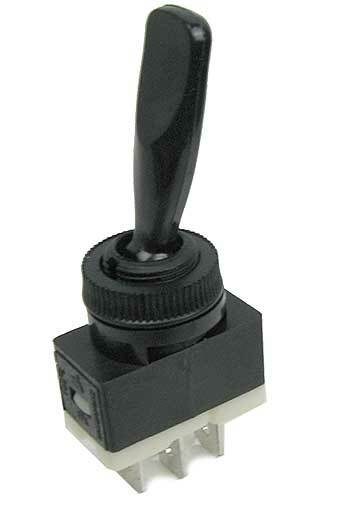 These SPDT momentary rocker switches from Otto® have (3) 1/4” quick-disconnect terminals and panel-mounting tabs. Measure 1-1/8” deep x 1” x 3/8” and are rated for 10.1A at 125VAC. UL/CSA. On-Off-On. And see the red light. 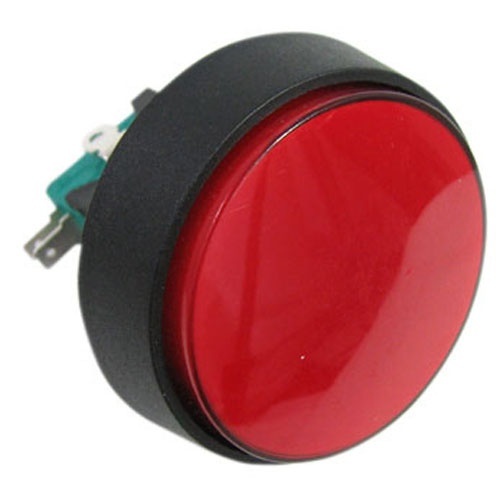 This panel-mount SPST push-on/push-off switch from Molex is rated for 125V and has a neon indicator lamp. Measures 2-1/4" x 15/16" x 1/2" with 3/16" quick-disconnect terminals. The panel face is 1-5/16" x 1/2" with plastic wings to keep it in place. The button is marked "AEC." 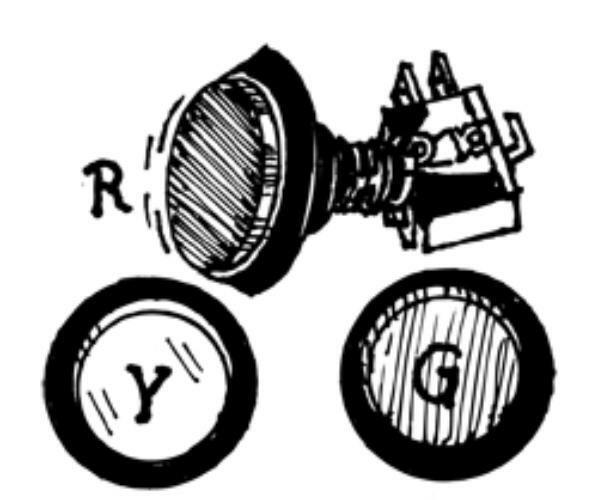 Two contacts for the switch; two contacts for the lamp (diagram included). Latching. UL/CSA. Made in the USA. These panel-mount SPST rocker switches have a switch on one side and a blank face next to it. Rated for up to 10A at 125V and 6A at 250V. Measure 7/8" x 15/16" with snap clips for mounting, a 1-3/16" spacer and quick-disconnect terminals. This SPST latching (push on, push off) pushbutton switch reminds CJ of a cathedral radio cabinet, which means he's no spring chicken, or else he's just nostalgic. But they are indeed pretty retro looking. Rated for 11A at 110VAC and 6A at 220VAC. 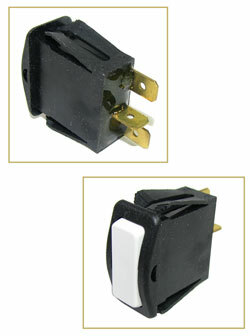 A pair of right-angle quick-disconnects are on the back. Measure 1-3/8" deep x 1-1/8" wide x 1-1/2" tall with a 5/8" dia button with flattened sides. No obvious way to mount them, but a clever person will figure something out. UL. These pushbutton switches have (8) sets of SPDT contacts and measure 2-3/8" long (not counting the button) x 1" x 5/8". The contacts for both rows, starting at the pushbutton, are normally closed; common; and normally open with (4) sets in each row. 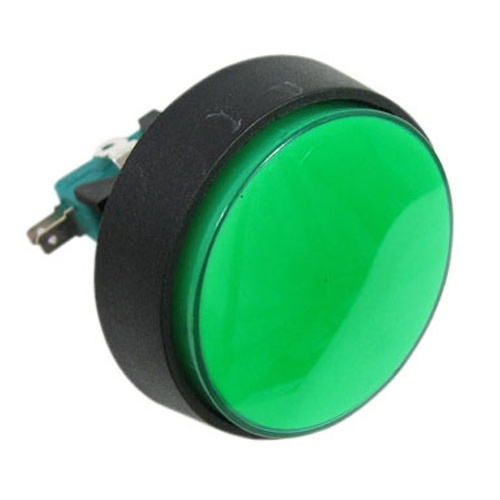 When the pushbutton is engaged, the window at the front is green. We think these were used as buss switches. Made in the USA for ITT/Schadow. 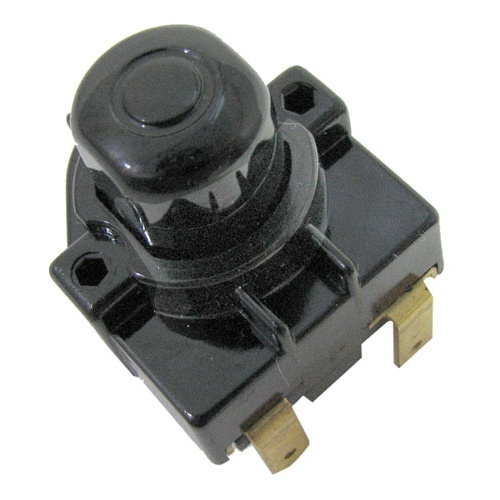 This panel-mount DPDT toggle switch is rated for up to 10A at 250V, and comes with (2) nuts and (2) washers. Measures 1-1/4" x 3/4" x 1-1/4" counting the (6) quick-disconnect terminals on the back. Bat is 3/4” long. 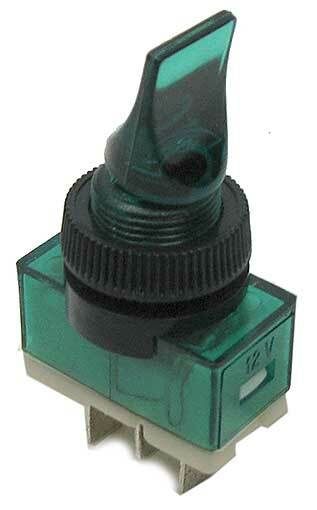 This panel-mount heavy-duty SPDT toggle switch is center-off and rated for up to 16A at 12V. Has a 1/2” dia threaded shaft with a plastic washer and nut, and a 1-1/8” long bat for ease of toggling. Housing measures just under 1” x 1/2” square with 1/4” quick-disconnect terminals. Write your own jokes here. 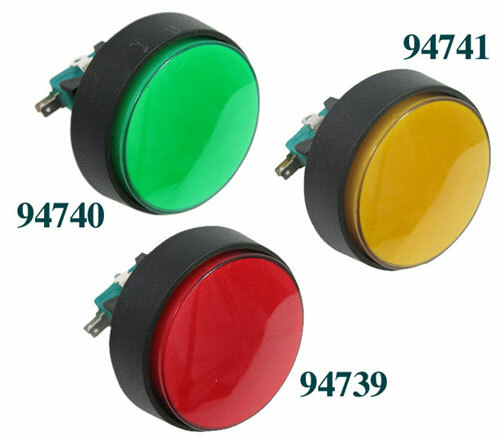 This panel-mount SPST duckbill toggle switch is rated for up to 16A at 12V and has a green indicator lamp that draws approx 300mA . Housing is just shy of 1" x 1/2" square with a 5/8" bat, a threaded 1/2" dia shaft and (3) 1/4” quick-disconnect terminals on the bottom.